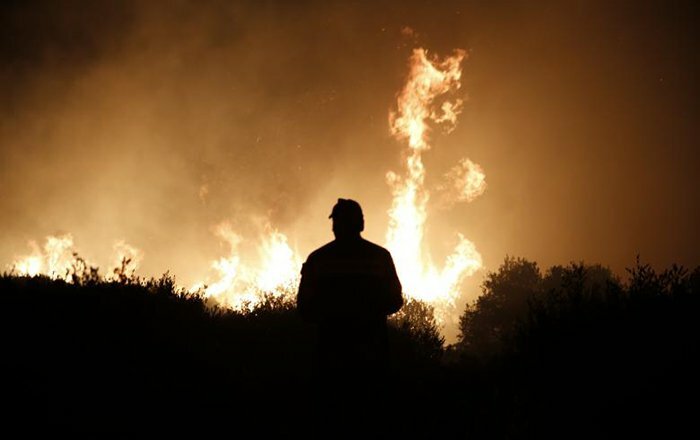 Fire fighters have been struggling all day and all night to extinguish the huge wildfire that broke out on the island of Kythira on Friday morning. One settlement was evacuated, power outages occurred. The fire broke in the agricultural area of Pitsinades, Mylopotamos. Strong winds that were blowing spread the fire quickly. Fire fighters, water dropping aircraft and helicopters were deployed form Peloponnese in order to assist local forces. At one point, the mayor of Kythira called on residents of Kypriotianika to be on alert, he later decided to evacuate the settlement as prevention. More than 85 fire fighters, three aircraft and one helicopter, volunteers and the whole mechanism of the island continue their efforts to take the fire under control. Several settlements and villages remained without electricity for several hours. there is no information whether the problem was restored by Saturday morning. According to the Greek Fire Brigades the general situation is a bit better on Saturday morning, houses are not in danger. Hope to take the horrific fire under control lies on the aerial means.